You are here: Home / News / Does Elena Kagan Believe Religious Freedom Trumps Discrimination Laws Protecting Gay Americans? Does Elena Kagan Believe Religious Freedom Trumps Discrimination Laws Protecting Gay Americans? 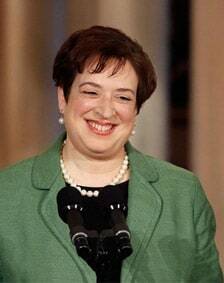 Michelangleo Signorile brings to our attention a post by Gay City News' Duncan Osborne looking at a 1996 memo written by then Associate White House Counsel Elena Kagan when she worked for the Clinton administration. The memo urged Clinton to side with religious conservatives in a case dealing with a landlord's objection to renting to an unmarried couple, because it went against his religious beliefs. Writes Osborne: "The memo, in which she is clearly expressing her own views, was sent to Jack Quinn, then the White House counsel, and Kathy Wallman, Quinn’s deputy counsel. Kagan, currently the solicitor general, authored it after Steve McFarlane, then the legal director at the Christian Legal Society, called her to say that a group of religious organizations would ask the court to review and overturn the California decision. That application was denied in 1997. Joining the society were the Church of Jesus Christ of Latter Day Saints, commonly known as the Mormon church, the National Association of Evangelicals, the Southern Baptist Convention as well as a coalition of Baptist organizations, the National Council of the Churches of Christ, and the American Jewish Congress." Osborne adds: "For lesbian, transgender, bisexual and gay Americans, Kagan’s position is not academic. Religious conservatives have argued that their beliefs should allow them to ignore anti-discrimination laws protecting the queer community." He notes that the Supreme Court struck down the Religious Freedom Restoration Act by a vote of 6-3 in 1997. Writes Signorile: "It's imperative that senators ask Kagan specifically about this case and whether or not she still agrees with the sentiments of her '96 memo and what they meant for anti-discrimination laws. And LGBT advocacy groups in Washington had better push them to do so, as well as demand answers from the White House and Kagan about her views on religious freedom and laws protecting gay, lesbian bisexual and transgender Americans."